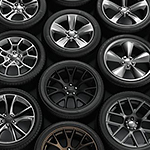 If you like to clean your car, then you’ve probably seen special wheel cleaners for your tires. In fact, your tires should be washed separately than the rest of your vehicle. Most detailers will start with the wheels because you typically loosen up grime and dirt underneath the car that will splash onto the rest of your vehicle. Once you’ve started cleaning your wheels, you probably have sprayed them and noticed they are not as shiny as when your detailer does it. That’s because they are using a type of cleaner like Wolfgang Tire and Wheel Cleaner or Pinnacle Advanced Wheel Cleaner. These are both made of gels that aren’t caustic to your tires, even if you have some type of coating on them. You can get the best clean and service when you visit Kyner's Auto Sales. You’ll find that these washes get all of the dust and grime out of your tires fast.